Management of life — in terms of processes, decisions and consequences — is probably an emblematic part of life in post-industrial societies. Increasingly, such management does not take place only on the level individuality, but dividuality — i.e. managing the data clouds, traces, and avataric transpositions of subjectivity in online environments. This is the context in which J. Nathan Matias’ talk on operational media design made sense (among other contexts of course), and provided an apt, and exciting, example of how through media design we are able to understand wider social processes. Nathan addressed “operationalisation” as a trend that can be incorporated in various platforms from SMS to online self-management and operationalisation. More concretely, “operational media” can be seen as a management, filtering and decision mechanism that can be incorporated into services and apps of various kinds. Nathan’s talk moved from military contexts of “command and control” (operationalisation of strategic ways into tactical operations) to such Apps as the blatantly sexist Pepsi Amp up before you score which allowed the (male) user to find “correct” and functional responses to a variety of female types. 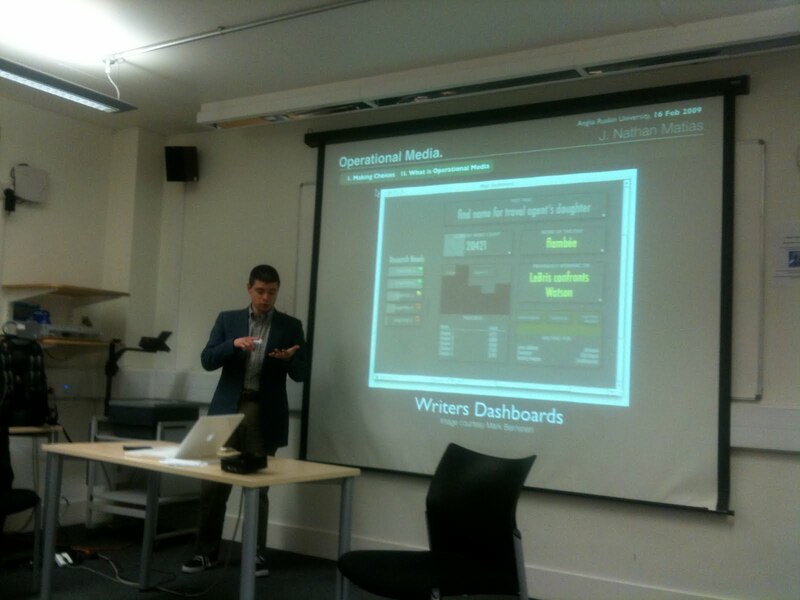 In addition to such, Nathan’s talk was able to introduce the general idea of computer assisted information retrieval and management which to me was a great way of branding a variety of trends into “operational media”. He talked about visualisation of data, augmented reality, filtering of data, expert, crowd and computer assisted information gathering, and a variety of other contexts in which the idea works. “Should I eat this croissant” considering its calories, the needed time I need to work out to get it again out of my system, the time available etc. is one example of operationalisation of decisions in post-fordist societies of high-tech mobile tools that tap into work and leisure activities. Another example is the service offered by Nathan’s employed KGB (not the spies, but Knowledge Generation Bureau. See their recent Superbowl ad here. The KGB service is one example of mobile based operational services which in the character space of an SMS try to provide accurate answers to specific questions and hence differ from e.g. search engines. Of course, one could from a critical theory perspective start to contextualise “operational media”. Is it a form of digital apps enhanced behavioralism that does not only assume but strengthens assumptions about the possibility of streamlining complex human actions? Is it a mode of media design that further distances management of life into external services? Is it hence a form of biopower of commercial kinds that ties in with the various processes from the physiological to cultural such as labour and provides its design-solutions for them? In any case, Nathan’s expertise in this field was a very enjoyable, and a good demonstration of a scholar/designer working in software studies.